Tired of feeling like a hot mess? ...and you could achieve that in as little as 15 minutes a day? You've got better things to take care of than all that stuff, Mama! Escape the burden of unending chaos and mess for less than the cost of dinner. Learn the simple, realistic and proven process to declutter your home & life so that you can have more time to spend how you choose. This is totally what I need! I'm in! You constantly feel overwhelmed or behind with your housework. If you can find just 15 minutes a day, you can escape chaos and find space for yourself. What would that space mean for you? Space in your home that isn't stressful or overwhelming. Cleaning will be faster and easier because there will be less to clean, meaning less time is required. More time for what is most important to you . Freedom to slow down and connect in ways you didn't even realize were missing in your life because you won't be so distracted and caught up in surrounding clutter. It was very simple to follow. I like the step-by-step method. My why happens to look exactly like yours. The truth actually stung my eyes a bit because it is so so true and I desperately want out of the mess cycle so I can be more present without the nagging in the back of my mind that there’s so much I need to do. I liked sitting and thinking about the way my house makes me feel right now as opposed to how I want to feel when I look around. I think that’s very helpful in helping to figure out what level of minimalism you want...I'm really looking forward to reading the rest of this book. 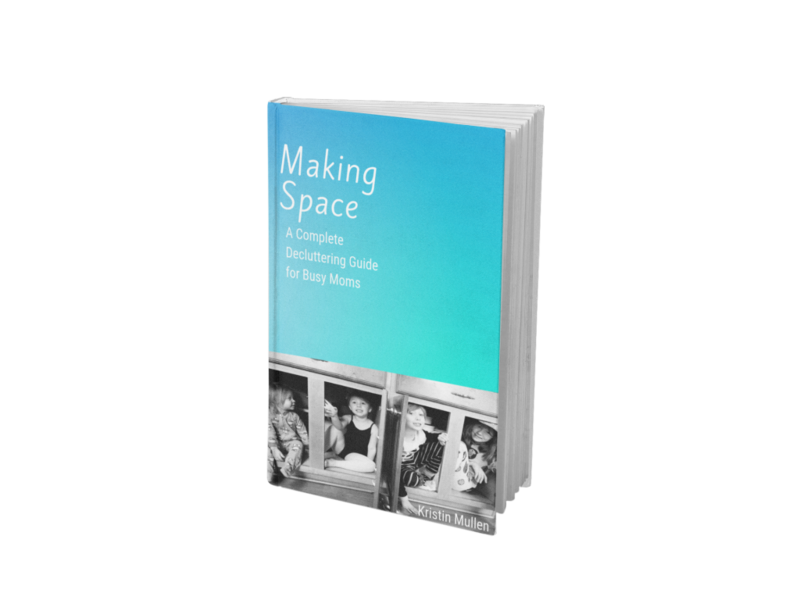 Get instant access to Making Space now! Get ready to unburden yourself from the mess. Make space for what matters most to you and let go of the rest. Who am I to be teaching you how to declutter and simplify? For most of my life I have struggled with getting and staying organized. I’ve always been a naturally sort of scattered person. Yes, I enjoyed having a clean, organized space, but I struggled to keep things that way. I was the type who would be late to an important event because I couldn’t find my keys. The one who would manage to lose a bright pink heel in my own closet, and who once was so distracted I turned in the wrong composition book (a blank one, I might add) during a crucial college exam. Shockingly, things did not improve once I had kids -- four of them! In fact, the chaos only became more amplified. But what also became more amplified was the reality of how much the mess affected me. We were living our lives in a constant state of survival. The goal was just to take each day as it comes and make it through it. 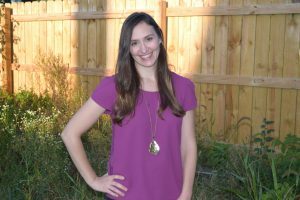 As a stay-at-home-mom, I was always in the mess and it stressed me out, made me feel anxious and overwhelmed at the thought of digging our way out of it. I tried a barrage of tactics to change the situation. I scoured the internet for any and all cleaning tips and routines and probably tried half a dozen. One in particular offered a daily list of tasks to complete each day, along with a weekly cleaning assignment. It seemed manageable and I dove in. And, when I followed the routines and assignments to a T, my house was clean. It did look nice. The problem: it took almost ALL of my time to keep up with it. My kids would ask me to play and I’d constantly be pushing them aside because I had to finish the next thing on my list. I’d yell at my kids any time they tried to play because they’d be making a mess. I’d snap at them and my husband, feel sorry for myself for “being the only one who cared about taking care of our house” and I’d get up early and stay up late to keep up with my routine. It was exhausting and my motivation to keep going quickly dwindled. I mean, who wants to wake up early and start their day by scrubbing toilets anyway? It’s not really worth jumping out of bed for – you know? I felt like I was missing out on my life because I was too busy cleaning up after it. So then I did a complete 180 and decided to try to just accept the chaos and the mess. Your kids are only young once. I didn’t want to be in the background of their memories. I wanted them to know they mattered. So I tried my best to ignore it. I tried not to care and told myself that anyone else who would ever see my house would understand and not care either (though I secretly cringed and died a little inside every time someone came to my door). But, then we were back to mess and chaos and survival mode.I really just thought I sucked at being an organized, functioning adult.I never wanted to have anyone over. And when we did, it would take me days to get our house “clean” for guests (and by clean I mean that all outward signs of mess had been shoved in closets and closed behind doors that were off limits to anyone). We were constantly running late, constantly losing things, missing deadlines for permission slips, scrambling, yelling, fighting and generally not very happy.So I went back to the exhausting cleaning routines. And one day, I found myself frustrated to the point of tears over the fact that I had spent my entire day working through a cleaning checklist that was supposed to take an hour and still hadn’t even broached the actual cleaning part yet. It suddenly hit me.We had too much stuff. I couldn’t keep up because there simply was too much to take care of. I began to look at my life and the stuff in it, in an entirely different way. Instead of just methodically picking something up and finding a place to stash it, I started questioning WHY. WHAT purpose does it serve in my life? HOW does it help me achieve the life I want to live? That was really the spark that started to change everything. I didn’t yet know what minimalism was. I didn’t know how to declutter or what that even meant. I just knew we had too much stuff. And I was ready to be done with that. I was ready to get my life back so it wouldn’t take me all day to clean. I was done choosing between my kids and having a house that didn’t cause heart palpitations. ... for YOUR LIFE and filling it with WHAT MATTERS MOST to you. This is about choosing to be in CONTROL of how you spend your time. This is about THRIVING and not just SURVIVING. I’ve been where you are now and can tell you first-hand that there is a better way. 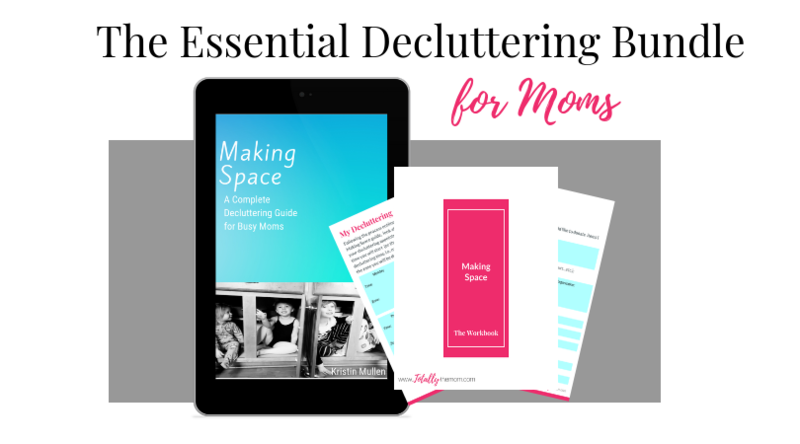 After much trial and error in my own life, Making Space is, step-by-step the exact process I’ve used to declutter my home in a way that actually works for a busy mom. It has changed my life and it can do the same for you. Is my home perfect all the time now? Ha – NO. I’m still on my journey and it’s always a work in progress. But my life has already dramatically changed. We’re not living in constant chaos anymore. I don’t feel like I’m drowning or just barely treading water to make it through each day. I can have guests over without freaking out, and the thought of someone dropping by unannounced doesn’t send me into a state of panic. Things are under control. And because of that I’ve been able to achieve so much more fulfillment in my life. I’m more present with my kids and husband. I’m able to take care of my family and still relax at the end of the day. I yell less. And perhaps most importantly, I decide how to spend my time – not my stuff. I want all of this for you, and by following the steps I have outlined in this guide, we’re going to make it your reality too. By decluttering your home, you’re going to be making space for living your life how you choose. I want to make space for a great deal! Sign me up! I’ve got stuff to do and it’s really hard for me to find ANY time to do anything away from my kids. How much time will I have to spend decluttering before I actually see any results? One of the biggest misconceptions about decluttering is this idea that you need to have a bunch of time to do it. 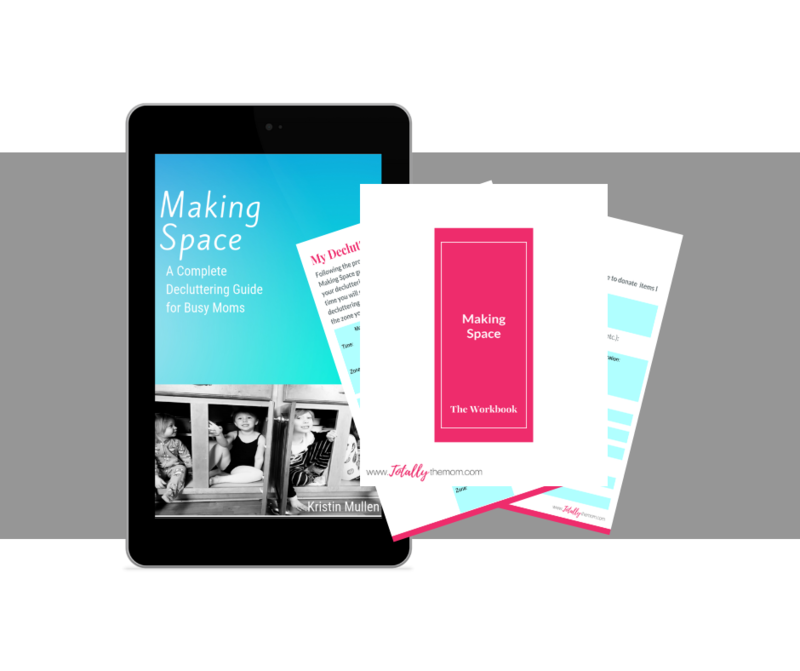 The process you’ll learn in Making Space was designed exactly for busy moms like you (by a busy mom like you) and is set up to be done in small bits at a time. In as little as 15 minutes per day, you can start to see and feel the transformation in your life. You can find 15 minutes for anything if it’s important enough to you, even if you’re so busy you barely have time to shower. Will I have to get rid of 98% of my belongings and never enjoy shopping again? Only if you want to. There are no rules about what to get rid of, how much, or even what not to buy. Because unlike most other decluttering books or programs, the focus isn’t about what you’re getting rid of, but rather, what you choose to keep. And that is something that only you can decide. It’s about finding the balance that works best for you. Not trying to conform your life to fit into someone else’s ideals. It feels logical to think that way. But that’s the problem, you’re not able to actually get and stay organized because you have too much to maintain. It’s impossible to keep your home clean because it’s too easy to make a mess. And here’s the real truth:You can’t clean clutter. You cannot organize it. No amount of pretty organizing bins or cleaning product is going to solve this for you until you address the underlying issue -- all the extra stuff. You have a few options to access the PDF of your decluttering guide. Once you complete the secure checkout process, you’ll be automatically redirected to a thank you screen where you can immediately download the guide and save it to your computer, mobile or even a file sharing cloud like Dropbox or your Google Drive. Additionally, you’ll immediately get two emails, one is your receipt, the other is a second link to download your PDF. You’ll have 30 days to download it. Do I need a Kindle or any special software to read it? No. The format of the guide is a PDF so that you can read it however you want. You could even print it if you wanted to. What if I hate it? Will I get my money back? In all my time creating content, freebies and emails for my students, I’ve never had anyone tell me they weren’t satisfied with their products, but I would never want you to be unhappy! While lots of digital product creators wouldn’t offer a return policy on such a low cost investment, it’s a big deal to me. If any time within 30 days from the date of purchase you decide that you’re not completely satisfied, you can request a refund for the purchase price. Escape Chaos. Make space for life. Discover the freedom of more time and less stuff. 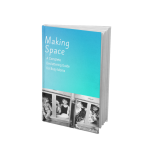 Take advantage of this special pricing for Making Space today. Yes, I'm ready to ditch chaos and start decluttering!